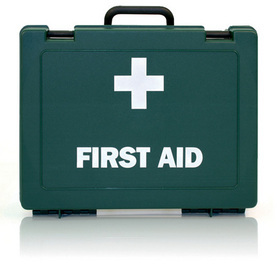 This Basic First Aid Quiz is a great way to test your understanding of key first aid skills. We’ve updated this basic quiz to follow the latest international first aid and CPR guidelines. Work your way through the questions and see how well you can do, good luck! This quiz is a great way to revise for an upcoming CPR or first aid test / written exam. Test your first aid knowledge with this basic first aid quiz. Need to improve your first aid knowledge? Try one of our other first aid quizzes or sign up to one of our first aid online revision courses. Also, we’ve got a list of first aid memory aids and mnemonics to help you remember key first aid information.